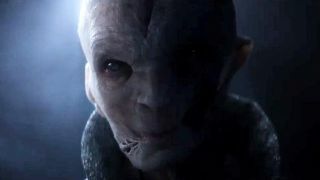 Supreme Leader Snoke was one of the (literally) biggest mysteries introduced in Star Wars: The Force Awakens, and fans have been ruminating on his existence ever since. Where did he come from? What does he want? Is he really that freaking huge? Ditto for Kylo Ren - we know he's Han and Leia's son, but what happened to turn him evil? What are the Knights of Ren? So the Force Link looks like it'll be the key accessory to a whole range of toys, including Kylo and Snoke. We can see how it works in the commercial, with the wrist-mounted controller containing some form of near-field communication that tells a toy to activate. Star Wars News Net has an image of a BB-8 themed playset which includes Snoke and his Praetorian Guard, and is also Force Link compatible. True, "I have been expecting you" and "The Resistance is doomed" are not particularly revealing or surprising, nor is Kylo Ren's line, "The darkness guides me." Still, at least now you know which toys to keep an eye on juuuuust in case these figures let loose some plot-spoiling details. And hey, I might be outside the intended age range of a Mighty Max-style playset, but that TIE Silencer is still pretty damn cool.